Cycling holiday in Cathar Land, Pyrénées. 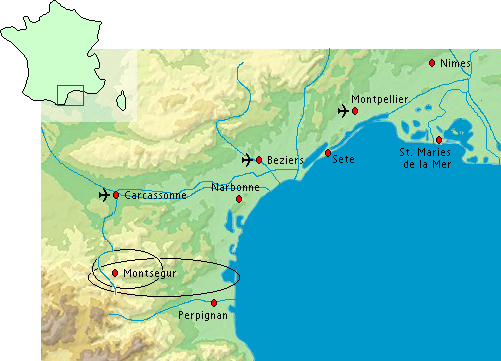 Cathar Castles or the Pyrenees : From Carcassonne, via the Canal du Midi and the Med to Montsegur. 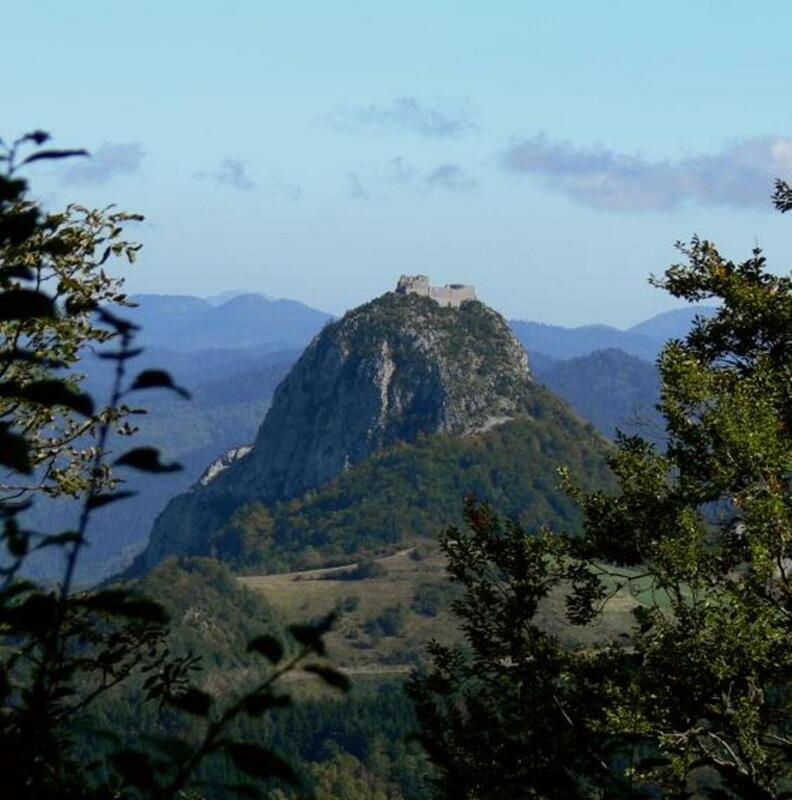 From the Mediterranean to the Pyrenees Ariegeoises in the heart or the sun blessed Corbieres region, or at Montsegur is where you can find the secret trails and Cathar castles. Imposing stone castles built high up in rocky crags of pogs. These fortresses are the symbol of a tragic, political intrigue and drama that shook the South or France. This walking holiday combines a historical interest that stirs the imagination as well as some memorable cycling through lush unspoilt mountains and valleys. 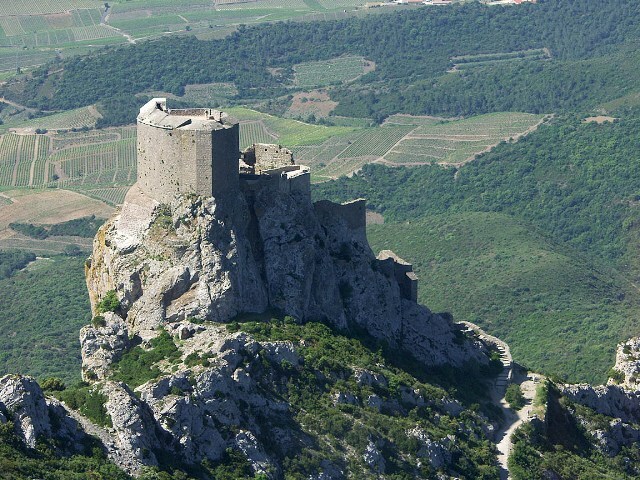 We offer the Cathar Tours as 5 to 12 days standard** packages(this page) or as superior*** packages , starting from Carcassonne. Included:bags-transfer, 5 dinners, 9 overnights+ breakfast. Lunches are not included. The price or a take-away lunch varies from 9 to 15 Euro. You can order it from the hotelkeeper the evening before departure. Parties of 6 persons : 20 % p.p. Parties of 8 persons : 23 % p.p. The 5-7 days packages have light to "active" stages. The 8-12 days packages have more active stages, espacially after Quillan. "egcum" in the tables below stands for: "cumulative positive elevation gains" of the day-stage. The distances are the minimal distance on quite roads to the next hotel. Minimum distances in kms per day. If you want to be informed once or twice a year on our walks and cycling tours you can add your name and email-address here in our contact-form.